This post should really be titled “The Basic Meal I Make Every Single Week Because It’s The Only Thing My Kids All Like”. This is that meal that I make when I don’t want to think, I don’t want to work, I don’t want to clean up a big mess and I don’t want anyone to complain about what we’re having for dinner. It’s not fancy food, but it’s really flavorful and something all my kids will eat. It’s also all made in one pot so I’m not stuck cleaning a bunch of dishes after. I could make this in my sleep, so it wasn’t until recently it occurred to me I should share it as a “real” recipe here on the blog. But sometimes these staples are the best things to share — easy, fast, kid-friendly and not much clean-up. It also makes great leftovers for lunch the next day! I always have the butcher chop up the chicken breasts for me, so all I have to do is throw them in the pan. p.s. Boneless chicken thigh pieces are great in this too. But my hubby hates them, so we stick with the breast. Add the oil to a Dutch oven on medium-high heat. When oil is heated, add the chicken pieces. Sprinkle with salt and pepper and cook until done. Remove from pan. Add onions to pan and cook until transluscent. Add the rice and bay leaf; stir to combine. Add the broth and bring to a boil. Cover the pan with the lid. Lower the heat and let it simmer for about 25 minutes, or until rice is tender and liquid absorbed. 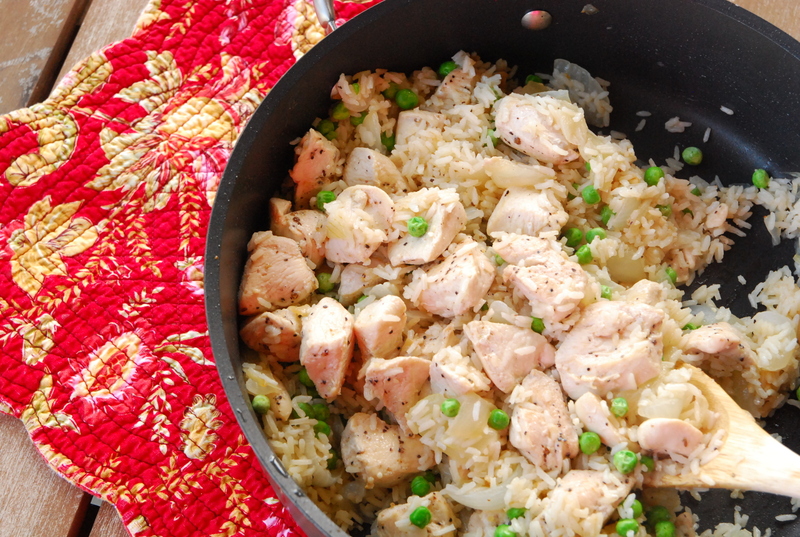 Stir in chicken and peas. Add the lime juice (optional) and additional salt and pepper if needed. Remove the bay leaf. Serve immediately.